New Baseball Training Products For 2007! Indoors and Outdoors. Portable Unit. Ratings: Scale 1 to 10. The Hurricane is a new brand of the rotational hitting machine made famous by the BatAction people, Nedco Sports. 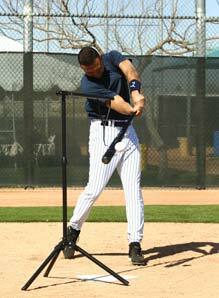 The rotational hitting machine is one of the very best training systems on the market today. The machine offers high speed batting practice alone without ever having to pick up or gather a single baseball. Players love the high speed challenging workout of the Hurricane Machine. The machine has adjustable ball speeds and heights for users of different sizes. The machine can be hit right and left handed without changing, adjusting or moving the machine. This makes it especially useful for team use with hitters working from both sides of the plate. The Hurricane is made by PPS and offers the same benefits as the BatAction Machine. The Hurricane and BatAction machines both were invented and patented by the same inventor, Nick Dixon. Jerking of the ZipnHit handles. The ZipnHit Pro is a popular high speed trainer for baseball and fastpitch softball.